Once I’m oriented, a map is nothing but a close-up of that mental image I form before every trip, an overview if you will, from space. I marvel at how far these maps have come since Major John Wesley Powell first came to the Southwest with pencil and paper and tried to make sense of these great cirques and valleys. To glance up at the cliffs and huge amphitheaters of the Grand Canyon’s Red Wall and then back down to the impossibly high tech orthographic projection of these features I hold in my hand, they are perfect and these images help me see their scale and shape even more clearly. 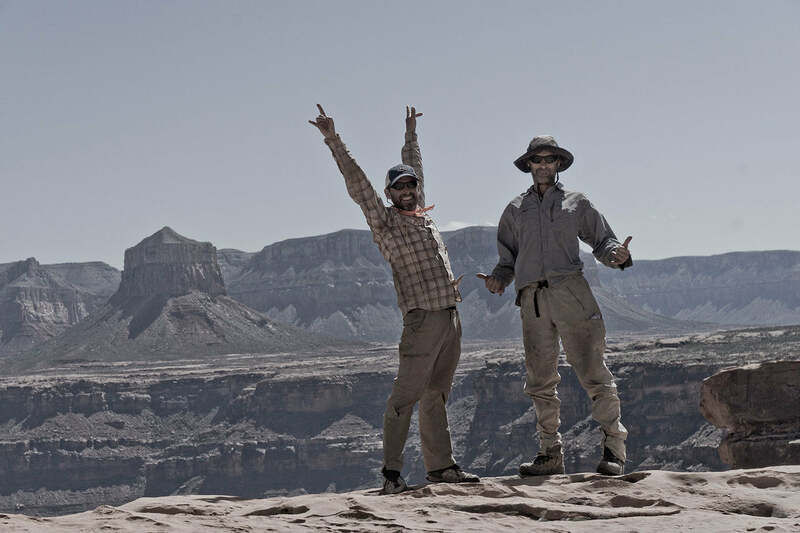 In this blog post, I recreated notes from the journal I took on the below-the-rim section hike of the Grand that Mike St. Pierre and I embarked on, March 2016. The section we did is part of what Rich Rudow calls, “The Grandest Walk“—a thru hike that traverses the Canyon below the rim. Mike plans on doing it in three sections; he invited me for the second leg of his journey. Though a mapmaker with decades of experience, I dug deep on this adventure. It was one of the most difficult of my life. Strong navigation skills and tools were integral to our success. 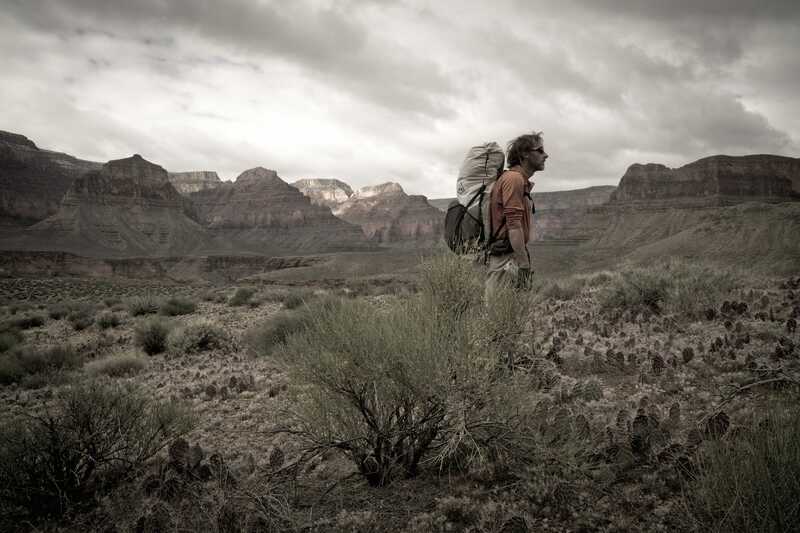 Maps, mids and camping deep in the Grand Canyon backcountry. On day four of our trip we awake to grey—grey skies, grey fatigue, a grey attitude like fog from last night’s sand storm and bad water. Everything above the 6,000-foot level is washed in fresh snow, including the rim above us. In the Crystal Creek wash, clear alkaline-poison water laps at our boots. I want to see something good in everything and think to myself: “At least in the weeks to come, the potholes will be full on the Esplanade…” From the streambed, our escape route out of the Crystal is unobvious. We just descended from Shiva Saddle, one of the highest saddles on the North Rim of the Grand Canyon, and dropped all the way to the river. Now we need to climb back up through five or six of the major geologic groups in the canyon, this time to the Sagittarius Saddle. If you’ve ever seen a photo looking down on the Grand Canyon from outer space you can see the dark, almost black looking boreal forests that cap one of the biggest “oxbow” bends on the planet. This immense arch stretches from Nankoweep at River Mile 53 all the way to Tapeats at River Mile 137. In the scorching desert of the American Southwest, this part of the geologic up-thrust that created the canyon itself, has become a forest of huge conifers and moisture, rising to an elevation of 10,000’. I hold onto this mental image as I study the maps of the inner canyon. Not just a random sweep of bends and corners, the river has purpose and direction; from its genesis to its evolution, modern topographical science magically reveals each of its secrets. 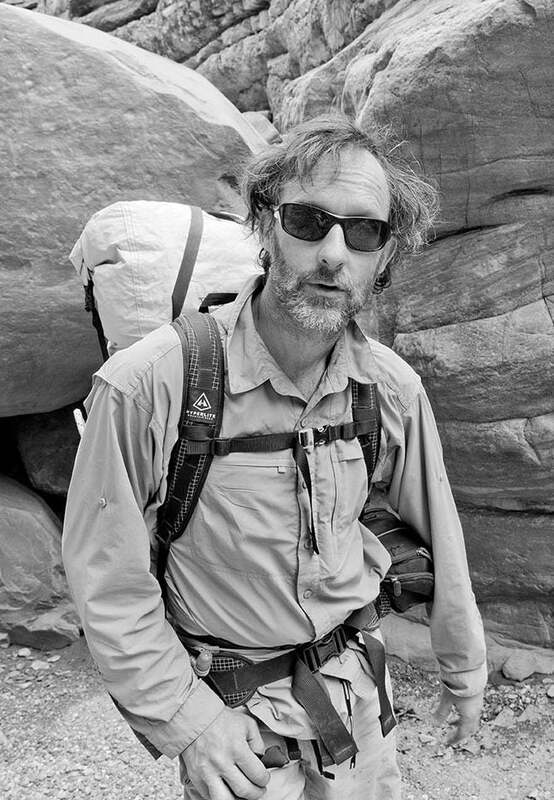 Author, mapmaker and adventurer, Clay Wadman. Case in point—rivers, creeks and drainages cut this huge uplift of the North Rim and its resulting aquifers, each clearly slicing across our topographic maps as each of these in turn descends to the river. The scale is so large you can only see them clearly if you lay out all the maps in sequence and stand back. Doing this reveals a vast 20-mile shortcut—a fault line that cuts laterally across the vast oxbow of the North Rim. Made up of a series of four canyons, linked by two high saddles, the fault runs in a straight line cutting off, in our case, about 35 grueling miles of river from our transect. Studying the contour intervals more closely one can see more of its secrets; and also its challenges. In some places numerous topo lines merge into a single bold line, indicating cliff bands. As we traverse this great vertical maze of strata, I note each of these conundrums; each relates to a cliff band and each cliff band corresponds to a specific elevation. Once over, each type of rock has different characteristics—some easy to climb, some utterly impossible. To my eyes, these dark constrictions of contours offer more than the valuation of their vertical height; they also hint at composition: granite, metamorphosed sandstone, shale, limestone and so on. Above us rises one of the most perplexing layers—Tapeats Sandstone, which caps granite from the inner gorge. There’s no way through because of the unfeatured horizontal nature of this metamorphosed sandstone layer. Bullet hard and made up of endless tiers of overhanging roofs, there’s just one possible point of passage—our literal “X” on the map. A buddy of Mike’s, Matt Jenkins, showed it to us on the hike in. He told us it was faster than traversing the endless cactus bench-land coming in from upper Crystal Creek. And so here we are, laboring up this grey slope of dark shale and granite. From camp, Mike started straight for the hillside. Looking closely at the contours on our map, however, we see a slight depression upstream where none of the contour lines crossed. From way down here it appears to be all the same grey hillside climbing into a sky drowned in flat cloud. We opt to hike upstream and ‘follow the map’, finding a steep gully leading all the way to the rim where an enormous block of Tapeats sandstone fell away long ago, revealing Matt’s “escape hatch.” The very nature of this blasted and sketchy terrain leaves us in a palpable gloom. The down sloping shale interspersed with cliff bands makes the terrain insecure and exposed. I move slowly here, but better than Mike; yesterday’s bad water made us both sick but he still seems hungover by it. The grey skies help keep temperatures down today, and the spectacular, snow covered canyon walls above us contrast to the dark river cleft below us. The adrenaline of free soloing this ambiguous terrain exhilarates me, but I can see in Mike’s body posture and expression that he’s not having fun. Looking into one of the many abysses of the Grand Canyon. I wouldn’t be here, but for Mike’s invitation. I want to cheer him up as our expeditions defacto photographer. Early on, we invited the famed photo master Ace Kvale to come, but he declined—I bet because his dog Gengis couldn’t come. Despite being vastly underqualified in terms of published pictures my vanity led me to think I had a good eye. Below me Mike’s white Hyperlite Mountain Gear pack shines like a beacon against the black granite of the ledge system and the white snow beyond. I frame a spectacular shot in my minds eye. I call back to him taking off my pack and carefully pulling out my camera. I knew this would cheer him up – he loved to sit and surf through our pictures in camp, looking for that “One in a Million” shot. I snap off a couple photos as he moves upwards. But as I move to stash my camera, it slips from my hand. First it slides a little on its strap and then tumbles. I instinctively jump for it, everything in motion for a split second; me, my pack, the camera falling towards the brink of a 200-meter cliff. Mike shouts for me to stop, but I have already frozen on all fours, to watch the flip, flop… acceleration and disappearance of one of my cherished SLR. Mike holds onto my pack while I scramble back down and around, into the gully looking for the wreckage. I find it, the lens and body—a cherished birthday present from my wife—both totally smashed. My mind goes back to Ace and our trips together. How few pictures he actually took. How he traveled in places like this. Had I been “seeing” all of this through the lens of a camera? Does he? Or is there a way to travel ‘in tandem’ with our technology rather than with it? Looking inwards rather than outwards I walk delicately and without stepping on the plants or the cryptobiotic soils. I think of Ace often; my Desert-Sensei and teacher of “what is.” Once he told me that they had come upon an expanse of virgin black cryptobiotic soil with no way around it. They stopped and studied their options and lines, deciphering which impact would possibly be followed by other travelers should anyone ever come there again. Taking off their shoes they navigated the precious life-giving soil in bare feet. It is not about the taking; it is about the leaving. It is not about the showing; it is about the seeing. Atop the Tapeat layer we drift apart now—I fighting the melancholy of loss while Mike searches higher up for an easier line. Where we walk on the vast Tonto Plateau, everything is clearly organized on the map. For me the USGS topo maps are like a cover story in the New York Times; names and features are headlines and a full text of contour lines. I carry my maps, always in hand, scribbling as I go. I note water features and breaks, mark travel time and measuring distances. I can look back and compare similar terrain navigated several days ago and see the hike times to deduce how many hours a certain stretch will take us. I divide all distances by the kilometer, not the mile, since that corresponds closest to the UTM grid lines. I then use a long column of math to add the vertical elevations lost and gained to propagate our total distances, ahead and behind. As we rejoin each other at a junction near the Tuna Creek drainage proper, we enter our targeted “fault line.” I have only seen walls like this on river trips, rising out of the main Colorado River channel. As we ascend the Grand Canyon, alcoves in the Red Wall line both sides of the valley—like the great abodes of the wind Gods and falling water. On our right, the west flank of Point Sublime rises 4,000 feet above us. On our left, the east face of the Sagittarius ridge marches forward until both formations meet at our destination the Sagittarius Saddle. As we climb upwards, we find the walls coming together and the difficulties returning. Pulling out Mike’s iPhone, we cross-reference for our route and position. The phone has a blue line drawn straight up the gut of the drainage. We zoom in close for clues, which disorients me immediately. All scale is lost, and the contours are pixilated stripes with no reference points. Clearly wrong, the blue lines cut straight through an overhanging wall of smooth limestone. Equally useless, my maps just show lines projected by computers from satellites in space. They can’t see the ledges or cracks; just the big brushstrokes. It is a tool at best, and sometimes, like my camera this morning, should be left in the pack. We head left toward seemingly more broken terrain. I hit a sheep trail, where small sharp hoof prints lead me through brambles and up steep gullies. Small dung pellets here. A bedding area on a ledge there. Sometimes obvious, sometimes obscure. Screw technology, here we need to stick with the locals. I follow their footprints. Light. Soft. Taking nothing. Seeing everything and finding a way. Mike St. Pierre and Clay Wadman succeeded on their section hike in part because they relied on Wadman’s skills with maps. Their electronic devices–the DeLorme inReach and Mike’s iPhone–were also important tools. The post Maps & an Ethical Compass For Grand Canyon Travel appeared first on Hyperlite Mountain Gear Blog.